Photographer Nguyen Duc Chinh shares memories from when he worked for the Liberation Army in southern Viet Nam during the American War. 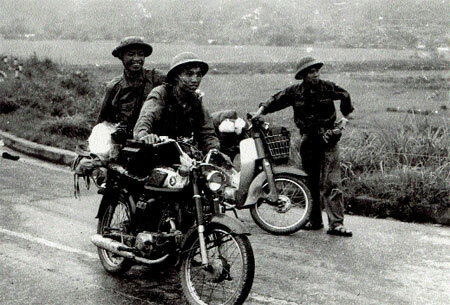 During the 1960s, the photography unit as well as different sections of the Giai Phong (Liberation) News Agency had to set up secret bases in South Viet Nam that were constantly being relocated to avoid detection by US - Sai Gon troops. Most of them were stationed deep in the jungle far from residential areas and rivers and streams to keep ourselves hidden from local people. Being war photographer does not mean we only take photos. We also need to know how to operate a dark room and develop our negatives. Before we can put these skills to use, we need to get a reliable source of clean water to support life in the jungle: water to drink, to cook meals, to wash up and last but not least, to develop negatives. In the middle of the jungle, hidden from the enemy and anyone who could give away our position, we had to make do with what we had. Using a crowbar, large machetes, a basket and some rope, we dug our own water well. The bases had dark rooms we used to develop our negatives near the wells. The wells were vital to our work there. None of us had ever dug a well before, but when we were faced with a difficult situation, we had to find a solution. 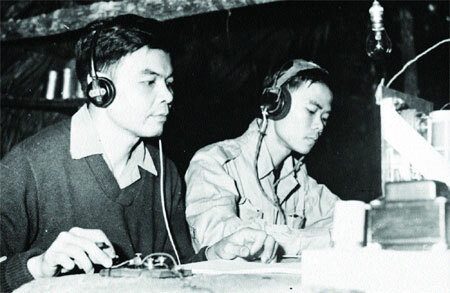 Sharing stories: Men use morse code at the Liberation News Agency, operating in the deep jungle of the south. The night before we started work on the well, I imitated a technique used by Vietnamese well-known geomancer Ta Ao that I'd read somewhere before. I placed three rice bowls face down on the ground around the base. In the morning, I checked the bowls to see which one contained the most dews, indicating where we would find water. Then we drew a one metre circle and started digging at that spot. We took turns to dig, and when we reached two metres, we had to start using the rope and bucket to haul the dirt out. As we got deeper, the oxygen levels dropped, and a few people even fainted. We lowered a large tree branch down to stir up the air in the hole. Then we checked to see if there was enough oxygen by lowering a burning candle. When it continued to burn, we knew it was safe to continue digging. Another man even boiled a big pan of water and poured it into the well to disperse the stagnant air. We toiled away in the well, but even at 10 metres, there was still no sign of water. Our spirits were dwindling, and for the last time I summoned up all my strength and drove the crowbar in to the well. A stream of water sprang out, and I called out for my friends to pull me up. 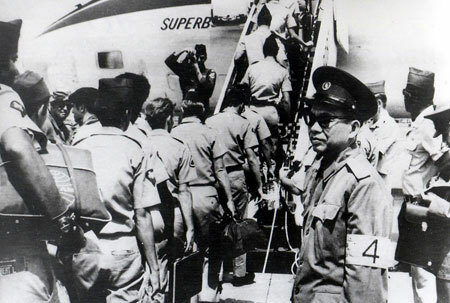 War's end: The last US soldiers board a plane to leave Viet Nam. An hour later, the water had filled the hole. We tested it by boiling some green tea. We knew if the water remained green, it was safe for drinking. In my ten years living in the jungle, I helped to dig six wells. The photography unit needed a dark room, and we cut trees from the forest to build the frame of a hut. It was roofed with leaves and tin sheets were used for the walls. One corner of the room was reserved for developing the films, and three people could work in the room at the same time. We often enlarged the photographs for mobile exhibitions in local provinces and districts. Our technical expert in the dark room, Nguyen Ngoc Mien could enlarge photos to 30x40cm or 40x60cm.